How Was the Great Pyramid (Giza Complex) Built. The idea that all the 'Memphite' pyramids were built over a time period of just a few generations is incredible... but clearly not impossible. "In the space of about one century approximately 25 million tons of limestone (alone) were quarried, dressed, moved and piled up into man-made mountains" (5). The result of calculating 100,000 people producing 2,300,000 blocks over 20 years is 1 finished block every 2.286 minutes. This figure includes quarrying, moving, dressing and placing each stone for the great pyramid, it does not include the labour for the other pyramids on the site, the limestone pavement, the causeways or sphinx. 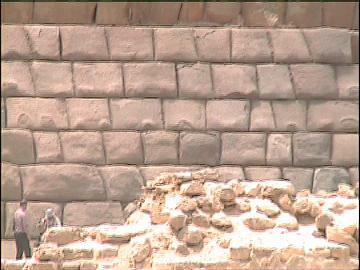 It also does not include any of the other (18+) large pyramids in the Cairo area. Was Giza designed from an original plan? Was the Great pyramid built from an original design. The 'Change of plan' theory. Which pyramid was built first. Are there any more chambers/corridors to be found? '..The builders introduced an additional measure to ensure stability. In each horizontal row of blocks a gentle grading was carried out by which the blocks at the edges were very slightly higher than those in the middle of the face. In this way the corners of each layer slightly concave towards the apex clearly a laborious and time-consuming device, requiring selection and grading of blocks before they could be laid'. The reason why the builders chose to use such gigantic stones (over 100 tons in various locations, and 50-70 ton granite slabs for the relieving slabs), has yet to be justified ergonomically. 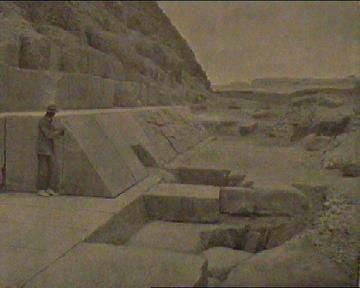 The construction of sacred sites with 'cyclopean' masonry is a feature seen around the ancient world, along with several other specific construction features at Giza. 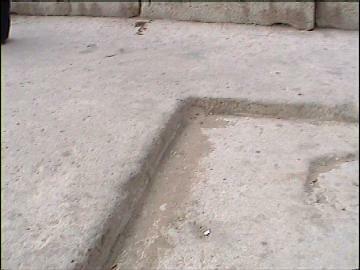 At the same time in Egypt, a change can be seen in the quality of the masons skills. Petrie found evidence of tool use (such as core drilling, saws etc), and the fact that these marks have been found on granite too, suggests that they must have been tipped with precious stones. In the Cairo museum one can see several examples of simple copper and bronze saws, which Egyptologists claim are like those utilized in the cutting and shaping of the pyramid blocks. These tools present a problem. On the Mohs scale of mineral hardness, copper and bronze have a hardness of 3.5 to 4, while limestone has a hardness of 4 to 5 and granite of 5 to 6. The known tools would have cut through limestone but would be useless with granite. No archaeological examples of iron tools are found in early dynastic Egypt, yet even if they were, the best steels today have a hardness of only 5.5 and thus are inefficient for cutting granite. Some years ago Sir Flinders Petrie, one of the "fathers" of Egyptology proposed that the pyramid blocks had been cut with long saw blades studded with diamonds or corundum. But this idea presents problems too. The cutting of millions of blocks would require millions of rare and expensive diamonds and corundum, which constantly wear out and require replacement. 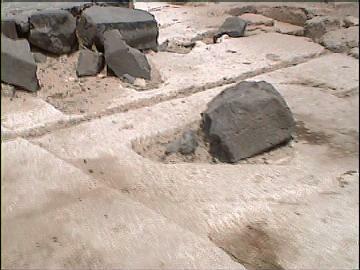 It has been suggested that the limestone blocks were somehow cut with solutions of citric acid or vinegar, yet these very slow-acting agents leave the surface of the limestone pitted and rough, unlike the beautifully smooth surface found on the casing stones, and these agents are completely useless for the cutting of granite. Evidence suggests that the stones were split in the same fashion as they are today. (Extract from the 'The Guardian' 1990) - 'Hawass discovered the tombs of the thousands of labourers who actually built the pyramids of Ghiza. Not far from the Great Pyramid, these modest tombs have existed in the sand for just as long, but no one thought of looking for them until Hawass hypothesized their existence and location in 1987. Digs confirmed he was right. As he has said', "The theories that the pyramids were built by people that came out of space, or the Jews or people from Atlantis have been disproved. The major discoveries that we made at Giza were the tombs of the pyramid builders which prove that the Egyptians built the pyramids and that they are the unique people who made this wonderful civilization'. Of course, in itself, this statement is false. It only proves that their were thousands of labourers were buried there, not why the complex was constructed. Other pyramids do not have such 'villages'. And while it is probable that they built the Giza complex, we must be careful in assuming too much. An inscription carved in the bedrock opposite the pyramid of Kephren informs us that the minister of labour, Mai, 'grandee of the temple of Maat', and Seankh-Pa, superintendent of construction at the temple of Amon in Thebes, worked on restoring the two great pyramids of Ghiza. Beneath the inscription is found, carved deep in the bedrock, the same mysterious symbol that is sculpted in the ceiling of the subterranean chamber (16). In the now-famous Nova experiment Egyptologist Mark Lehner and stone dresser Roger Hopkins visited the Mokkatam quarries, where stones are still broken the same way as they were 5,000 years ago. The only difference is the iron tools used today. In this experiment, 14 quarry workers produced 186 blocks in only 12 days, using the traditional methods. One worker therefore produced the equivalent of 1.2 blocks per day. From Egyptian models and relief's we know that the typical quarry team had 6 members, so each team could have prepared 2 blocks per day without any problem. Equation: Based on Herodotus (and Lehner). Herodotus says 100,000 men for 20 yrs to complete approx 2,300,000 blocks. 2,300,000 divided by 16,666 teams = 138 blocks per team. 138 divided by 2 (per day) = 69 days work per team to quarry the stones. The unsolved problem of how the 2,300,000 very heavy blocks were transported to the building site of the pyramid is mostly explainable. How were the blocks taken to the nearly 500 ft height of the pyramids' summit, was it with 'machines' made with wooden planks as Herodotus claims or a ramp? Extract from the 'Hitat' - Al-Masudi (died 956) - Who among other things wrote: "It was common to build pyramids like a staircase, with large steps. When it was completed, the sides were smoothed from top to bottom by hammering away the steps. It was an artful method and it required strength, stamina and the will to obey to orders". Extract from the 'Hitat' - In which it states that the teacher Ibrahim b. Wasif Sah al-Katib (400 AD), who was interviewed by al-Makrizi the author said: "They had leaves of paper with writings on it, and after a stone had been broken and worked in the quarry, they put those papers on the block and could then move the stone with a single push over a distance of 100 Sahm (ca. 300 m); they repeated this until the stone was on the pyramid." Extract from Petrie - The means employed for raising such masses of stone is not shown to us in any representations. For the ordinary blocks, of a few tons each, it would be very feasible to employ the method of resting them on two piles of wooden slabs, and rocking them up alternately to one side and the other by a spar under the block, thus heightening the piles alternately and so raising the stone. This would also agree with the mysterious description of a machine made of short pieces of wood-a description which is difficult otherwise to realise. This method would also be applicable to the largest masses that we know of in the Pyramid, the 56 roofing-beams of the King's Chamber and the spaces above it. These average 320 x 52 x 73 inches, or 700 cubic feet each; weighing, therefore, 54 tons, some larger, some less. No simple system but that of rocking would enable men to raise such a mass with only the help of crowbars; if such a block was put on two supports, say 30 inches apart, only 5 tons would have to be lifted at once, and this would be easily done by 10 men with crowbars. Six such parties might raise the whole of these blocks in one year. Although ramps undoubtedly require a lot of work, they have been found at other sites such as, Saqqara, Sekhemkets pyramid at Meidum, Lisht, Abydoss, Luxor, and also at Ghiza. Although the Great Pyramid is considered to have been built first, it occupies neither the highest ground nor the most central position, but instead is situated on the lower part of the plateau, very close to the northern cliff. This position required that the causeway to the temple on the east, or valley side, be supported by a massive ramp ascending the cliff to a height of nearly 100 feet. If the builders of the Great Pyramid had the entire plateau at their disposal, why did they not choose the more favourable setting of the central or Second Pyramid - the causeway of which ascends a natural incline? While the site chosen for the Second Pyramid gave an advantage in height over the base of the Great Pyramid, of some 30 feet, it seems strange that use was not made of the still higher and more level ground, further to the northwest. Instead, the Pyramid was built where the natural rock-surface sloped downwards considerably towards the southeast, so that the site had to be artificially levelled. This was achieved by the cutting away of a deep escarpment along the north and west sides, while a megalithic foundation platform was built to support the southeast corner. Similarly in placing the Third Pyramid, the northeast corner and the temple on the east side required to be supported, where the natural rock fell away, by a massive substructure to a height of up to 15 feet. Why was such work undertaken when use could have been made of more level ground, further to the west? These details suggest that there was some factor, more important than considerations of architectural setting or ease of construction, which determined where the three Pyramids were positioned. Two photos from the Edgar Brothers expedition to Giza c.1910. demonstrating the fact that the limestone plateau is naturally riddled with underground channels and cavities. 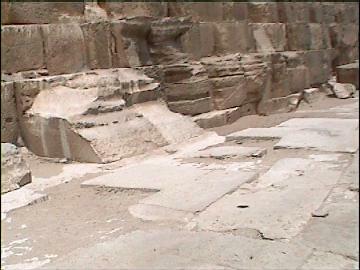 The first Step of the pyramid rests on a platform of finely finished limestone blocks. These blocks are approximately 2.5 ft x 10 ft x 10 ft. They project beyond the outer edges of the first Step's Casing Stones an average of 2 feet on all sides. This platform is so flat that the official survey of the Egyptian Government found that it was less than ½ of an inch from being level. 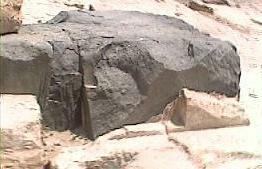 The removal of several platform stones showed that the bedrock had been cut and levelled to receive each individual stone, sometimes as deep as 1 to 2 inches. On the north side the platform stones have been laid at an irregular angle, each socket being carefully cut to receive the next stone. 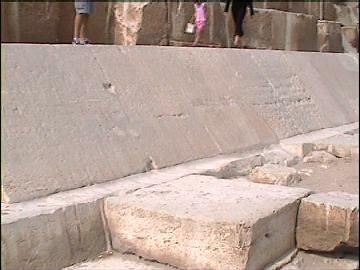 One explanation for this irregularity of stone placement is that these northern platform stones will have greater resistance to sliding from the downward and horizontal pressures of the pyramid's face. 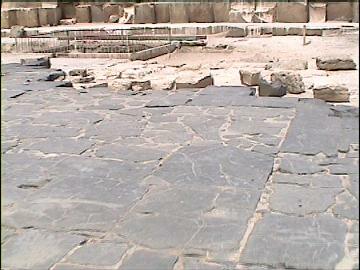 The huge paving slabs run under the 'great' pyramid. Note the difference in erosion between the exposed casing stones (left) and those uncovered last century (right). The bedrock was levelled and carved to fit individual stones. Sections of the pavement were built with a contrasting black basalt. The seam between the basalt and the limestone pavements. So much attention, time and energy was expended on some of the internal features of the Great pyramid that they require justification. For example, the star-shafts, which were created at the expense of an enormous amount of labour. These and other internal features show an application of extreme skill and attention to detail. Why? These are design features that suggest a functionality. They were built for a purpose (i.e. the 'Polar door', the 'sockets' up the walls of the 'Grand gallery', the 'well-shaft' and the 'portcullis). There is no doubt that the internal passages and chambers were important. Granite has been used at great expense to sheath most of the internal features, yet they were sealed off. However, they were not completely closed, as testified by the mechanism in the ante-chamber of the kings chamber, which suggests the possibility that it served a purpose before the pyramid was finished, or that it was intended to be used after. This is in direct contradiction with the 'Tomb' theory (or Petrie's 'Change of plan' theory). Apart from the well-shaft, (which appears to have been left intentionally almost finished) there seems to be no way that the internal passages can have been 'used' after they were built, as they were plugged up. In other words - In its present form, it wasn't built to be 'used' immediately after construction. This can be expanded on by saying that it wasn't built to be used after the level of the granite plugs (unless they were slid into place later). It is curious that the subterranean chamber at the bottom of the descending passage (the only open one), shows none of the finesse of the work above, yet the shaft was cut to an accuracy of less than an inch over its entire length. These polar passages were important as testified by its length and accuracy. Should the upper parts still be concealed, it would certainly have the appearance of being unfinished. Observation - Petrie observed a number of imperfections in the internal features. This was his 'proof' that it was not divinely constructed. He formed an opinion that these defects represented a 'change of plan' in the construction. He also believed that there were two different masons at work; One far superior than the other. He is trying to explain why there are 'defects' in measurements as well as quality and finishing off. Many of these 'defects' can be explained rationally in other ways, for example, the lack of floor in the 'Queens' chamber, could be because it was removed. Similarly, it is likely that some of the unexpected measurements were caused by subsidence. The evidence of plastering 'by hand' to 'cover over' damaged blocks in the 'Kings' chamber is of interest as one can only assume that this was done in order to 'disguise' the cracks - but from whom, as it is appears from the evidence of forced-entry that this was done after the pyramid was finished. Extract from Petrie: - The Pyramid of Khufu at Gizeh had no granite outside it; that of Khafra had one or two courses of granite; that of Menkaura had nearly half its surface covered with granite casing; thus there is a progressive use of granite by these successive kings; and at Abu Roash the Pyramid was entirely cased with granite, and therefore next in order of work after that of Menkaura of Gizeh. And this is all the stronger evidence, because no other examples of granite casing on a Pyramid are known. * Again, the diorite statue at Abu Roash was apparently like that of Khafra in size, material, and inscription (section 105), which also tends to fix this Pyramid to the fourth dynasty. Hence, until more remains shall be found at Abu Roash, and more is known of the other reputed Menkaura kings, it may be considered that this Pyramid was built next after the three Pyramids of Gizeh, though making a slight reservation in favour of the earlier dynasties. * Excepting some on the anomalous little Pyramid at Riga, of the 5th dynasty. Petrie also says - All these chambers over the King's Chamber are floored with horizontal beams of granite, rough dressed on the under sides which form the ceilings, but wholly unwrought above. These successive floors are blocked apart along the N. and S. sides, by blocks of granite in the lower, and of limestone in the upper chambers.....In the third chamber, the N. and S. sides are of granite as before; but they rest on pieces of limestone, put in to fill up hollows, and bring them up to level: this 'showing, apparently, that the stock of granite supporting blocks had begun to run short at this stage of the building, and that any sort of pieces were used up, being eked out by limestone, which in the upper chambers supplied their places altogether......In the fourth chamber the supporting blocks along the N. and S. sides are all of limestone"
Note: Petrie says both that there was 'a progressive use of granite' from Pharaoh to Pharaoh but also that the stock of granite 'had begun to run out' during the building of Khufu's upper 'relieving' chambers. 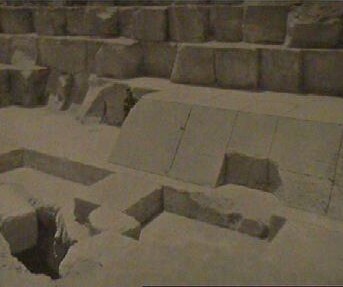 The highly polished limestone casing stones that covered the pyramid were fixed with a 'fine aluminosilicate cement' (1). The finished pyramid contained approximately 115,000 of these stones, each weighing ten tons or more. These stones were dressed on all six of their sides, not just the side exposed to the visible surface, to tolerances of .01 inch. They were set together so closely that a thin razor blade could not be inserted between the stones. Egyptologist Petrie expressed his astonishment of this feat by writing: - 'Merely to place such stones in exact contact would be careful work, but to do so with cement in the joint seems almost impossible; it is to be compared to the finest opticians' work on the scale of acres". Extract from Petrie - The use of plaster by the Egyptians is remarkable; and their skill in cementing joints is hard to understand. How, in the casing of the Great Pyramid, they could fill with cement a vertical joint about 5 X 7 feet in area, and only averaging 1/50 inch thick is a mystery; more especially as the joint could not be thinned by rubbing, owing to its being a vertical joint, and the block weighing about 16 tons. Yet this was the usual work over 13 acres of surface, with tens of thousands of casing stones, none less than a ton in weight. Extract from Petrie - From several indications it seems that the masons planned the casing and some at least of the core masonry also, course by course on the ground. For on all the casing, and on the core on which the casing fitted, there are lines drawn on the horizontal surfaces, showing where each stone was to be placed on those below it. If the stones were merely trimmed to fit each other as the building went on, there would be no need to have so carefully marked the place of each block in this particular way; and it shows that they were probably planned and fitted together on the ground below. Another indication of very careful and elaborate planning on the ground is in the topmost space over the King's Chamber; there the roofing-beams were numbered, and marked for the north or south sides; and though it might be thought that it could be of no consequence in what order they were placed, yet all their details were evidently schemed before they were delivered to the builders' hands. This care in arranging all the work agrees strikingly with the great employment of unskilled labourers during two or three months at a time, as they would then raise all the stones which the masons had worked and stored ready for use since the preceding season. While it is accepted (begrudgingly), that the ancient Egyptians used cement in their 'seamless' joints, the French chemist and pyramid explorer Joseph Davidovits proposed that the stones themselves were also formed from concrete, mainly on the basis that the precision was within tolerances of 0.01mm in cases. It is noted that the only dimension that is constant on the casing stones is the height, and that the same precision was carried out on marble and through solid rock. It is an interesting theory and requires exploring. "This type of fossil-shell limestone concrete would have been cast or packed into moulds. Egyptian workmen went to outcrops of relatively soft limestone, disaggregated it with water, then mixed the muddy limestone (including the fossil-shells) with lime and zeolite-forming materials such as kaolin clay, silt, and the Egyptian salt natron (sodium carbonate). The limestone mud was carried up by the bucketful and then poured, packed or rammed into molds (made of wood, stone, clay or brick) placed on the pyramid sides. This re-agglomerated limestone, bonded by geochemical reaction (called geopolymer cement), thus hardened into resistant blocks." There are some problems with this theory. We can see that Khufu's is the best example of pyramid stonework. As the process was so successful, why wasn't it carried on later? It is suggested that the builders carried approximately double the current weight of the pyramid (water too). There is no evidence of mould markings and not one block is the same size as the other (except the course heights which were constant). It was observed that a number of blocks have sedimentation, exactly the same as in the quarries. To which Daviots' responded that the stones might not have been made in one day, so during the night sand could have been blown in which was covered by new material the next day, and therefore looked like sedimentation. In order to explore these ideas without prejudice, it is important to know first whether the site was designed or evolved through independent and separate constructions phases as Egyptologists claim and when. 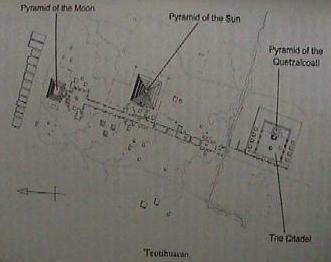 It has been noted that there is a similarity between Orion and the layout of the three pyramids. This similarity has been recognised at other ancient sites around the world such as Teotihuacan in Mexico. Where, amazingly, the main pyramid (The pyramid of the sun), has the same ground dimensions and exactly half the height. It was realised by Stansbury Hagar, that Teotihuacan had been built as a 'map of heaven'. During the 1960's and 1970's a comprehensive mathematical survey was carried out by Hugh Harleston Jr. He found that the principle structures line up along the street of the dead (and beyond), and that the city was a precise scale model of the solar system, including Uranus, Neptune and Pluto (not rediscovered until 1787, 1846 and 1930 respectively). Ground-plan of Teotihuacan and a comparison of the two pyramids in cross section. Note - The Hurlers, Thornborough henge's, Clava cairns and other Triple-circles/ Henges in the UK, also have one slightly off-centre structure. The following diagrams illustrate the geometry of the Giza structures. When combined, the statistical probability that the site was built according to an original design increases considerably. 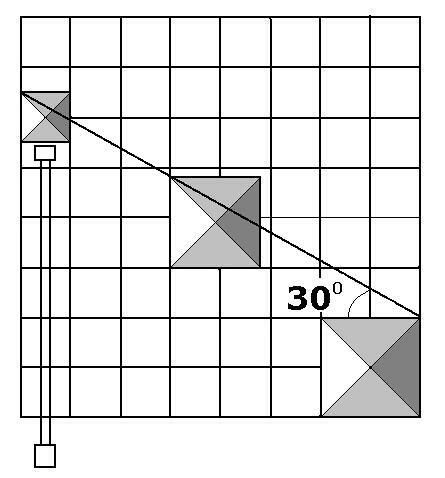 An 8x8 grid can be used to demonstrate the principle geometry of the site. Note that the two causeways meet on a point of the 8x8 grid. Also note the presence of a vesica-pisces, which also sits on the 8x8 grid. The exterior angle of the great pyramid can be formed with the vesica-pisces. The Giza pyramids also share simple Geometric relationships between themselves. Geometry connects the 'satellite' pyramids. 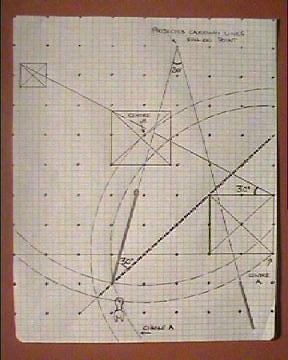 This 'external' geometry has been observed at other pyramid sites in Egypt. It was Hans Goedicke who made some early suggestions. But they were not published first in a scientific journal, but in a newspaper in 1983. And what does the theory say? Well, Goedicke noticed that there seems to be a common constructional element at several necropolises: one corner of each structure is often on a straight line with the same corner of other structures in the necropolis. 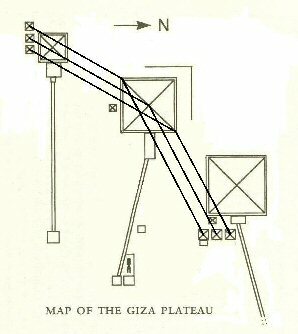 These alignments are found at Giza (south-east corners of Khufu, Kaphere and Menkaure), Abusir (north-west-corner of the pyramids of Sahure, Neferirkare und Neferefre), Saqquara (south-east-corners of Sekhemkhet, Djoser, Userkaf und Teti) - and even between necropolises as Goedicke thinks that the east face of Userkaf's Pyramid is aligned with the same face of Khufu's Pyramid several kilometres to the north! 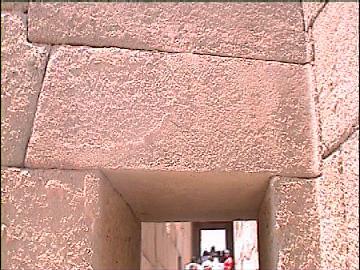 Goedicke later concluded that some of these sight lines were aimed at the solar temple at Iunu (Heliopolis). Fig. 5 - Pyramid sight lines at Abusir, Saqqara and Giza. Fig. 5 - Abusir, Saqqara and Giza all have corner alignments to Heliopolis. As we can see, Giza has two sets of corner-alignments, not one. The evidence certainly suggests that there was an 'original design' for the Giza complex, and a very specific one too. If this is accepted, then it has an impact on the 'pyramids as tombs theory'. It is also important to determine whether the Great pyramid itself (and all of its chambers), was built from an original design. Again there are various definitive studies that clearly show exactly that. 5.30) Was the Great pyramid built from an original design? Herodotus (440 BC), recorded that Egyptian priests told him then that the Great pyramid was designed so that the area of each face was equal to the square of its height. This means that the designers incorporated Pi (∏) , and Phi (Ф) in the following fashion. The obvious presence of geometry at Giza certainly supports the theory that the plateau and the Pyramids were built from a specific and original design. However, while the complex appears to be based on a single design, it doesn't necessarily follow that it was constructed in a single construction phase. In fact the opposite may well be the case. Much of this theory is based on original observations by Petrie. It is worth exploring some of the features of the pyramid that led him to his conclusions. It is noticeable that the subterranean chamber was the only chamber left available to the casual observer. All the others were sealed off and hidden. Extract from Petrie - During the course of building there was evidently a great change in the style of the work; a change, however, belonging more to the builders than to the masons. The pavement, lower casing, and entrance passage are exquisitely wrought; in fact, the means employed for placing and cementing the blocks of soft limestone, weighing a dozen to twenty tons each, with such hair-like joints are almost inconceivable at present; and the accuracy of the levelling is marvellous. But in the higher parts, the gallery, for instance, is far from such excellence; and the upper part of it is very skew and irregular, the ramp surface being tilted mor e than an inch in a width of 20 inches. In the Antechamber the granite has never been dressed down flat, and defective stones are employed; where the limestone was very bad, it was roughly plastered over, and many parts are strangely rough. In the King's Chamber the masonry is very fine, both in its accuracy of fitting and in the squareness and equal height of all the blocks; but the builders were altogether wrong in their levels, and tilted the whole chamber over to one corner, so that their courses are 2¼ inches higher at the N.E. than at the S.W., a difference much greater than that in the whole base of the Pyramid. An error like this in putting together such a magnificent piece of work, is astonishing, for the walls are composed of nearly 1/10 of a mile length of granite blocks about 4 feet high, and probably as thick, all of which are gauged to the same height with an average variation of only 1/20 of an inch. As it would be difficult to suppose any architect allowing such errors of building, after so closely restricting the variations of masons' work, it strongly suggests that the granite had been prepared for the chamber long before it was built, and that the supervision was less strict as the work went on, owing to more hurry and less care, or owing to the death of the man who had really directed the superfine accuracy of the earlier work. (The level of the courses in the 'Kings' chamber are probably due to subsidence -(see Le Mesurier). It is also strange that the quality of work in the star shafts above the 'Kings' chamber remained so good, while other parts have 'defective stones' and 'strangely rough' plastering. While Petrie finds this supportive for a 'change of plan', there are still inconsistencies. Extract from Petrie - Beside these signs of carelessness, there are several points in which work that has been intended has never been carried out. The stone was left in the rough where it was liable to damage, and was to be finished off after it was safe from injury. Over the N. doorway of the gallery the stone is left roughly in excess; and in the Queen's Chamber the vertical edge of the doorway is left with an excess of an inch or more, and as a guide a short bit was drafted to the true surface at the top and bottom of each stone. From these points we see that not only was the work hurried about the middle, but that some parts never received the finishing strokes. 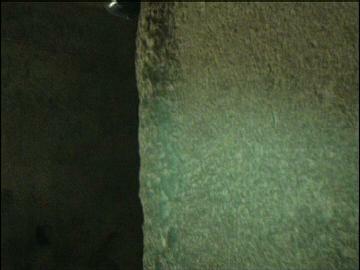 (The lip on the entry to the queen's passage could represent the remains of a damaged feature - photo above, right). Extract from Petrie - The plan of the passages was certainly altered once and perhaps oftener, during the course of building. The shaft, or "well", leading from the N. end of the gallery down to the subterranean parts, was either not contemplated at first, or else was forgotten in the course of building; the proof of this is that it has been cut through the masonry after the courses were completed. On examining the shaft, it is found to be irregularly tortuous through the masonry, and without any arrangement of the blocks to suit it; while in more than one place a corner of a block may be seen left in the irregular curved side of the shaft, all the rest of the block having disappeared in cutting the shaft. This is a conclusive point, since it would never have been so built at first. A similar feature is at the mouth of the passage, in the gallery. Here the sides of the mouth are very well cut, quite as good work as the dressing of the gallery walls; but on the S. side there is a vertical joint in the gallery side, only 5.3 inches from the mouth. Now, great care is always taken in the Pyramid to put large stones at a corner, and it is quite inconceivable that a Pyramid builder would put a mere slip 5.3 thick beside the opening to a passage. It evidently shows that the passage mouth was cut out after the building was finished in that part. It is clear, then, that the whole of this shaft is an additional feature to the first plan. (This is a controversial point. Could it not also be that it was a part of the original design, but with one section being deliberately left uncut? It is this section that we now know as the roughly cut section. It is unlikely that it was 'forgotten', or that it was 'not contemplated at first'). The fact that it was faced with smooth-cut blocks from the gallery down suggests that this upper part at least was included in the design). Davidson points out that the accuracy of the 'plugs' at the bottom of the ascending passage precludes them from being slid down at a later date. He then points out that they are lower than the door. Although it is known that the lower section of the ascending passage was cut through existing masonry. Question: The limestone block that was placed below the granite plugs is comparatively small (considering its function as the sole means of hiding the upper passages and chambers of the pyramid). Why was it so small, especially if the granite plugs were slid into place? This much however, is certain. If the gable stones over the door are original (as they undoubtedly are), then anything on the same level or below that does not show evidence of intrusion can also be considered an original feature from the first construction phase. This includes the Descending passage, the upper section of the Well-shaft, the Horizontal passage and the Queens' chamber. As the Star shafts within the Queens chamber rise higher than the Grand gallery or the Kings' chamber and its star-shafts, we can include them in the same design. Comment - The 'Change of plan' theory is based on several specific observations. It is the interpretation of these features that has given credence to the theory. Perhaps it might be more correct to say there might have once been a change in Function, but there is no conclusive proof to support the 'change of plan' theory. That there was no change of plan in respect to the outside is borne out by the overhead photos which show the concave masonry, which continues to the top. This very much supports the idea that any adaptations can have been internal only. Petrie refers to features in the Queens chamber and later authors refer to the upper star-shafts as evidence of a 'change of plan'. However, the star shafts continued to be built above the 'Kings' chamber, which also has features that can be interpreted as 'unfinished'. If Petrie is right, and there was a change of plan, it is curious that the Queens chamber, with its valuable granite slabs in the ceiling, should be left as a part of the building instead of filling them in. Also the star-shafts are labour intensive and demand an explanation. In fact, one has to justify the whole idea of building another set of passages and chambers above the already existing, and central, Queens' chamber. While most attention at Giza is usually focused on the 'Great' pyramid and the sphinx, it is an undeniable fact that 'Khafre's' pyramid both connects to the sphinx and holds the central position on the plateau. The Sphinx itself is, of course an extremely important part of Giza. The connection between the Sphinx and the pyramid builders is contentious. While some believe that the Sphinx was built by Khafre, there is evidence that it was there long before him, and therefore an argument that it is the reason for the pyramids presence in the first place. So exactly why does the pyramid of the son of the builder of the Great pyramid hold the central position of the complex, and attach to the Sphinx. It has been shown that the pyramid of Khufu is on lower ground. 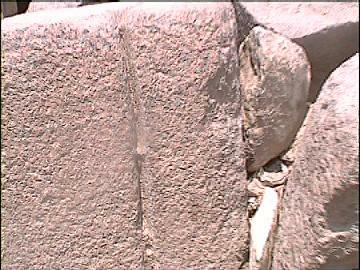 The reason for this is that it was placed on the edge of the plateau, which had to be raised artificially on one side. If it was the first pyramid, why would it have been positioned there unless there was an original plan for the whole site? The 'Well-shaft' has been suggested to have been an original feature; possibly from before the pyramid was built. While there is no evidence for this, it does offer an explanation for the amount of extra work involved in locating the first pyramid there. 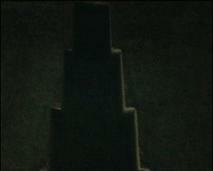 It has already been observed that both 'Khufus' and 'Menkaures' pyramids have the same concave walls. This is an architectural feature that was neglected in the central pyramid, which according to convention was constructed after 'Khufu' and before 'Menkaure'. How do we explain this change of design, while no other improvements or changes can be seen (except perhaps, the progressive use of granite for casing stones). (It is noted that the granite is all from the same source - suggesting that all the buildings are contemporary). 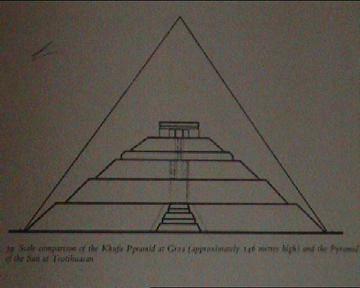 Extract from 'Life and Work', by Petrie (p187)- 'I was compelled to gaze up at the pyramid with its vast bulk, and believe that there is another chamber still undiscovered there, and one which will prove to be the very muniment room of the whole monument'. But is this is a purely romantic notion or not? A survey of the structure in 1992, by French engineer Professor Jean Kerisal, using ground penetrating sonar and microgravimetry, detected a 'structure under the floor of the horizontal passage that connects with the descending corridor, which could be a corridor orientated SSE-NNW, whose ceiling is at the depth of the Descending corridor would have reached had it been prolonged'. 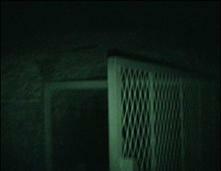 A second clear anomaly was 'detected on the Western side of the same passage six metres before the chamber entrance. According to our calculations, the anomaly corresponds to a vertical shaft at least five metres deep with a section of about 1.4 x 1.4 metres very close to the Western wall'. (3). 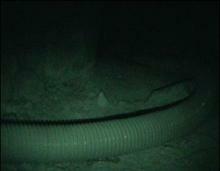 Gantenbrink showed evidence of movement in the Queens southern shaft at a specific location. As the Kings chamber shows 'ancient movement' of its own perhaps these are related? An experiment carried out on the Pyramid of Chephren in 1968, by a group of scientists from the Ein Shams University near Cairo, was conducted for 24 hours a day for a year. The Experiments measured cosmic ray penetration in order to determine the presence of extra cavities. When the data was studied on computer, the result was chaos, with different readings from day to day. Dr Amr Gohed, director of the expedition, was quoted as saying, 'there is some force that defies the laws of science at work in the Pyramid'. (9). Under the 'Niche' in the 'Queens' chamber, and at floor level, there is a gate which covers a roughly cut tunnel into the rock. The tunnel contains an air conditioning tube (I don't know where it leads), and goes forwards for approximately 6 metres before it opens out a little and then continues upwards in the direction of the 'Kings' chamber. My guide told me that he believed that it met another tunnel that had been found under a block on the floor of the 'Kings' chamber. At the antechamber of the 'Kings' chamber there is another small gate at floor level (on the right as you enter), the first time I was in, it was closed and dark. On my second entry, however, something had changed. Presumably for a reason. Note - the lights are on..... ??? It is believed that all the 'Memphite' pyramids were built in the space of a few generations. Each horizontal row of blocks was graded gently up towards the edges. 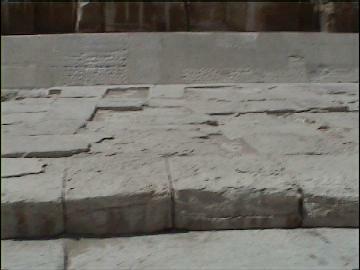 An inscription 'opposite the pyramid of Kephren' speaks of a restoration. 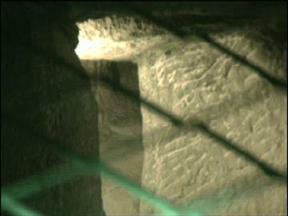 The inscription has a similar symbol to that found on the subterranean chamber. The graves of thousands of 'workers' were found at Giza in 1990. There are copper and bronze saws in the Cairo museum. Copper or bronze, alone are not strong enough to cut limestone or granite. In the 'Nova' experiment it was shown that one worker can quarry, on average, 1.2 blocks per day. There is no representation to show how they raised the stones. Other pyramids show evidence of ramps. The Great pyramid occupies neither the highest ground nor the central position at Ghiza. The Giza plateau was levelled for the placing of the Pyramids. The plateau was covered with 'paving-stones' that are level to within ½ inch across the site. The bedrock was cut and levelled to receive each individual paving stone. There are some internal features that appear to suggest 'functionability'. 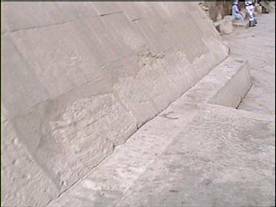 The Granite 'plugs' suggest that the pyramid wasn't intended to be 'used' after completion. Granite was used for many of the internal features (as in other Memphite pyramids). Granite was used for some of the exterior casing stones on other 'Memphite' pyramids. It would not have been possible to get a sarcophagus into the subterranean chamber. The descending passage was finished to an accuracy of (?) but the lower chamber was left 'unfinished'. There are some 'defects' in the construction. The damaged blocks in the 'King's' chamber were plastered over by hand. Progressively less granite was used in the higher relieving chambers. The highly polished casing stones were fixed with fine aluminosilicate cement. The casing stones were dressed on all six sides. The Great pyramid had approx. 115,000 casing-stones weighing 10 tons or more, to 0.1 inch tolerance. Evidence suggests that each stone was planned and fitted on the ground before putting it in place. There is a similarity between the layout of the Giza pyramids and the Orion constellation. The same similarity has been noticed at Teotihuacan, Mexico. There are a number of examples of external geometry relationships between the Giza pyramids. The corners of pyramids at other 'Memphite' sites show alignment. Some of the alignments point to Heliopolis. There are a number of internal geometric relationships in the Khufu pyramid. The three granite 'plugs' are lower than the entrance. The 'change of plan' theory is flawed. It is 'Khafres' pyramid that holds the central position on the Giza plateau, and connects to the Sphinx. Unlike 'Khafres' pyramid, both 'Khufus' and 'Menkaures' pyramids have concave walls. There is a progressive use of granite for casing-stones from Khufu (0) to Khafre (1) then Menkaure (?). 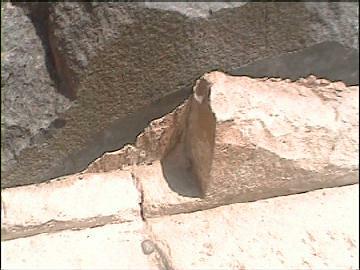 Several cavities have been detected inside and around the Great pyramid which remain unexplored. 1). G. Rawlinson. The Story of the Nations: Phoenicia. 1889. T. Fisher Unwin.